Did you know our Charleston County School District has 49,000 students, 3300 teachers, and 2100 support staff? These facts and much more were shared by Rev. 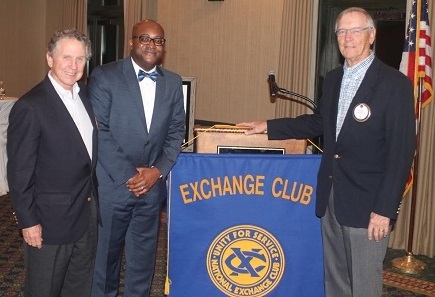 Dr. Eric Mack Sr., Chairman of the Charleston County Board of Trustees, at the Kiawah-Seabrook Exchange Club meeting on February 6, 2019, at Turtle Point Club on Kiawah Island. Dr. Mack talked about the efforts of two groups of community stakeholders addressing concerns for future educational designs. “Charleston Shared Future” has studied previous research, data, and experiences and created possible scenarios about the future of education in CCSD. “Shared Future Project” is delving deeper into equity and inclusion issues in our schools following a six-month research study in 2018 by Clemson University. Successful programs in our District Nine Schools were highlighted by Dr. Mack. One such program is the Summer Reading and Math Program at Angel Oak Elementary School established by Kiawah-Seabrook Exchange Club’s Angel Oak Award 2019 recipient, W. Allen Reed. Mr. Reed will be honored on February 13, 2019 at the Seabrook Island Club for his dedication to literacy and youth on our islands.